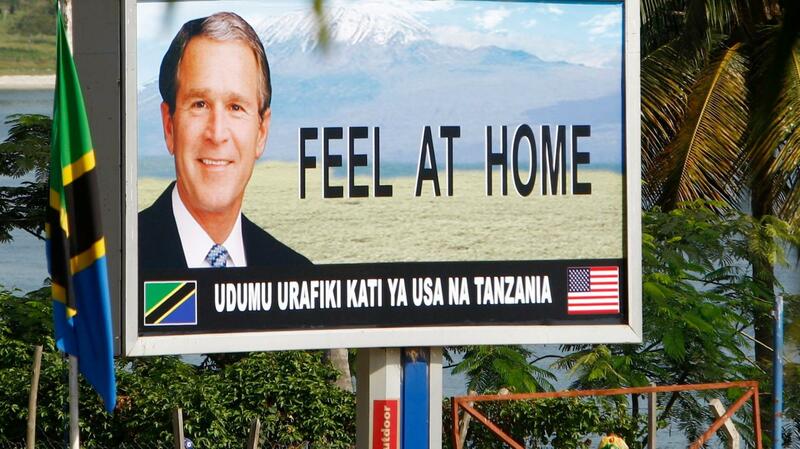 A sign promoting the visit of US president George W. Bush is seen in Dar es Salaam, February 2008. Melania Trump has just concluded her trip to Africa, her first major solo international swing as US first lady. In her choice of nations to visit—Ghana, Malawi, Kenya, and Egypt—she followed in the footsteps of not just former first ladies but also American presidents. Franklin D. Roosevelt was the first US president to set foot in Africa, landing in Bathurst in British Gambia in 1943. Roosevelt was on his way to Casablanca in Morocco to strategize on the course the allied forces would take in fighting World War II and demanding the “unconditional surrender” of their enemies. Given that Nazi U-boats prowled the Atlantic, Roosevelt couldn’t travel on a ship and thus became the first US president to travel on official business by airplane. Since then, eight other American presidents have visited the continent, both for a brief disembarking from a plane or a full-on state visit. 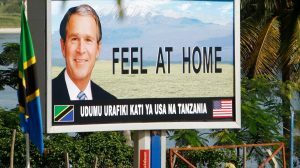 George W. Bush is top on this list, having toured 11 states across Africa according to the Office of the Historian at the US Department of State. Bill Clinton visited 10 nations as president, while Obama went to nine. In total, however, US leaders have only visited 16 of the 54 countries that make up Africa, making repeated stops in a few of those nations. US President Bill Clinton with daughter Chelsea in Abuja, Nigeria, August 2000. Trips to African countries by US presidents are undertaken either for security and geopolitical reasons or humanitarian purposes, says Alex Vines, head of the Africa program at the London-based think tank Chatham House. And since Africa has long been viewed as an addendum and not key to US geostrategic interests, “it is not surprising,” he says, that US heads of state only focus on specific countries—even during the Obama administration. Egypt is the country most visited, with every principal from Jimmy Carter to Barack Obama making a stop there at least once. The north African nation sits at a crucial nexus connecting Africa to Asia, the North Atlantic to the Indian Ocean, besides straddling a key border with Israel. As the most populous Arab nation, US officials have worked to nurture the relationship between Cairo and Tel Aviv for decades, ensuring that stability in the region and the 1979 peace treaty were upheld in exchange for billions of dollars in annual aid to Egypt. Senegal has also been a popular choice, Signé argues, because it has a history of broad political participation, and as a Francophone nation, helps extend US influence beyond English-speaking nations. This is in contrast to China whose top leadership makes regular trips to the continent in order to advance diplomatic, economic, and military interests. African leaders are also taking note, collectively trooping to Beijing whenever the opportunity arises.